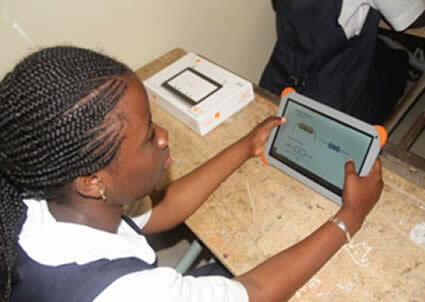 Digital education is one of the major focuses of the Orange Foundation in France and abroad. 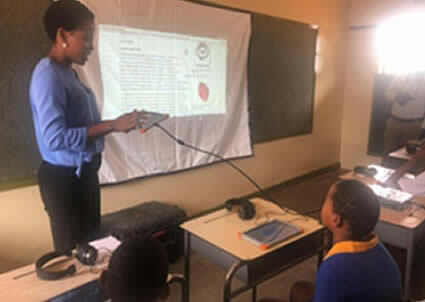 In this context, The Foundation launched “the Digital Schools” program in 2014, aiming to deliver free educational content in digital format for primary and secondary school pupils in Africa and Middle east. This program has already been massively deployed by the local foundations and the Orange group subsidiaries in 14 countries: France, Botswana, Côte d’Ivoire, Central African Republic, Cameroun, Niger, Madagascar, Senegal, Tunisia, Mali, Guinea, Egypt, Jordan, Democratic Republic of the Congo, covering 700 schools and benefiting to more than 160 000 children..
Today, we are launching a new call for projects in order to reinforce the “Digital Schools” Program in isolated rural areas and in suburban areas for the most disadvantaged schools with no access to school books. This call for project will be split in two parts: one for the donation of the digital kits, and one for the sourcing of digital and educational content for primary school education. The call for projects for the donation of material is designed for Orange local Foundations or Orange subsidiaries in countries where the Orange Group operates, who will coordinate and consolidate the applications of the schools (this concerns local applications as well as those coming from third party partners). The supported international projects will be conducted in partnership with the Orange local Foundations or subsidiaries, and with the local Ministry of National Education. The integration in the kit of a tablet dedicated to the teachers (with its own SD card) is also under review: this would enable teachers to appropriate the device in order to remotely prepare the courses and could also be used for the projection of the courses in class. The value of one kit is estimated at 5000 euros. A maximum of 15 kits will be allocated to each country. A kit can be used either for the opening of a new digital school, or for the reinforcement of a previously equipped school, in order to provide access to this material and content to more pupils. This call for projects (material donation and/or funding request) therefore concerns the extension of the program to new schools, but also the improvement of the program in previously opened schools. For the new candidate, the Orange Foundation may provide funding up to 6000€ for the recruitment and remuneration of a pedagogical mediator for the implementation of the program during the first year. This year, each candidate school shall have an Orange employee as a godfather/godmother in support to the pedagogical mediator, in order to follow the implementation of the project and to measure its results. The call for projects for the content is dedicated to the development of our actions in primary schools in Africa and to the associations working towards academic support in France. It is opened to all type of applicants (editors, developers, companies, associations…). This year, we are targeting to develop our Raspberry Pi servers (and their SD card) and the Digital Library of the Orange Foundation by integrating new educational content facilitating basic learning (read-write-count), and programs facilitating primary education on all subjects. The produced content will simultaneously contribute to the Digital Library of the Orange Foundation (currently being redesigned) which gathers digital educational content, available for all teachers of our digital inclusion programs. The content will also be available on an online platform (Card Shop), accessible to our pedagogical mediators in the different countries, so that they can customize their SD cards according to the specific needs of each country. You may submit your projects online from Monday, 4 February to Friday, 1 March. Please fill in the application form online and attach the required documents. The selection committee will take place on Monday, 13 March 2019.